Have you checked what’s trending on Twitter today? If so, you couldn’t have possible missed one of the trending topics: #newtwitter. What’s this #newtwitter buzz all about? Basically, Twitter is rolling out a new design that will make things easier and more fun for those of us who communicate in 140 words or less on a regular basis. 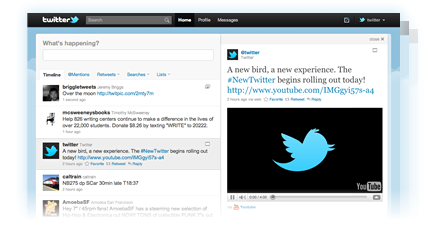 If you visit the page dedicated to the new Twitter design, I promise you won’t be able to help it – you’ll get excited. Take a look at the video teaser below. So the new Twitter is going to have a viewing pane, which will allow users to see videos and photos shared in tweets without having to leave the home page. That’s obviously handy – who likes leaving a page to see media anyway? Another development is that users will now have links to @mentions, retweets, searches, and lists just above the timelines, providing easier access as well. Well, it IS about time that Twitter did something like this, don’t you think?